The Franklin was the 20th of Chaucer’s pilgrims to give his tale and, like so many of his fellow travellers en route to Canterbury, he gave forth on the secrets of success in love. Thus did England’s earliest literary great teach us a lesson about the virtues of patience. Stoicism was of course a building block of Chaucer’s 14th Century age of chivalry but his lesson has been forgotten over the intervening 600 years, and nowhere more so than in the febrile world of football. Jürgen Klopp, Liverpool’s new manager and self-styled ‘Normal One’, has remarked on this in recent days. “Oh, I can’t believe that England is so impatient,” he moaned. Yet the German has benefited from this impatience. There was a time when if you switched on a radio phone-in, the only calls were from Liverpool supporters demanding his predecessor, Brendan Rodgers, be sacked. This column has previously recorded how the circumstances that led to his dismissal were not necessarily Rodgers’s fault [see first related article below]. He was in charge of Liverpool during a time of increasingly restricted investment by comparison with their Premier League ‘big six’ peers. What Klopp was pointing out in his lamentation of English impatience was that it is likely this trend will continue at Anfield: there will be no transfer-market quick fixes. Excellent work Jürgen. But these absolutes are misleading in the context of a football competition. The most important thing to note is that the seventh-place finish of 2014-15 came after a number of disruptions to his squad. First, Robert Lewandowski, scorer of 74 Bundesliga goals in his four seasons at BVB and the creator of 30 more, left on a free transfer to their biggest rivals, Bayern Munich, as his contract had expired. Worse still, Klopp was without key players like Ilkay Gündogan, Marco Reus, Jakub Blaszczykowski, Nuri Sahin, Sven Bender, Erik Durm and Lukas Piszczek for extended periods throughout the season. This, as explained in the second related article below, is enough to damage any club’s prospects on the pitch. So it was not a level playing field for Borussia Dortmund in Klopp’s final season. However it would be incorrect to describe BVB as ever competing on a level playing field in the Bundesliga. This is because as one of the biggest clubs in Germany, Klopp was manager of a team that enjoyed advantages over many of their domestic peers. 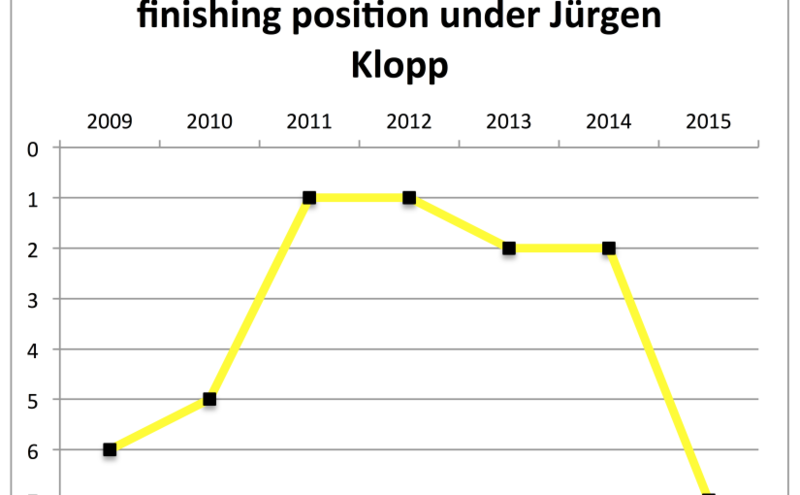 Dortmund’s turnover under Klopp was always at least a double-digit percentage greater than the Bundesliga average. 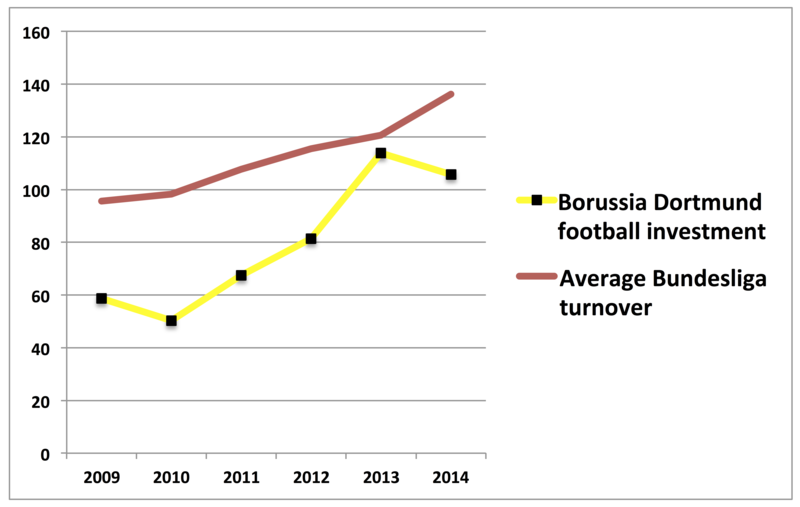 But the Bundesliga average is itself misleading. As a league it is made up of 17 regional clubs and one global giant in the shape of Bayern Munich. Take Munich’s picture-distorting revenues out of this analysis and Dortmund emerge clearly as a club of substantially greater means than most of their peers. 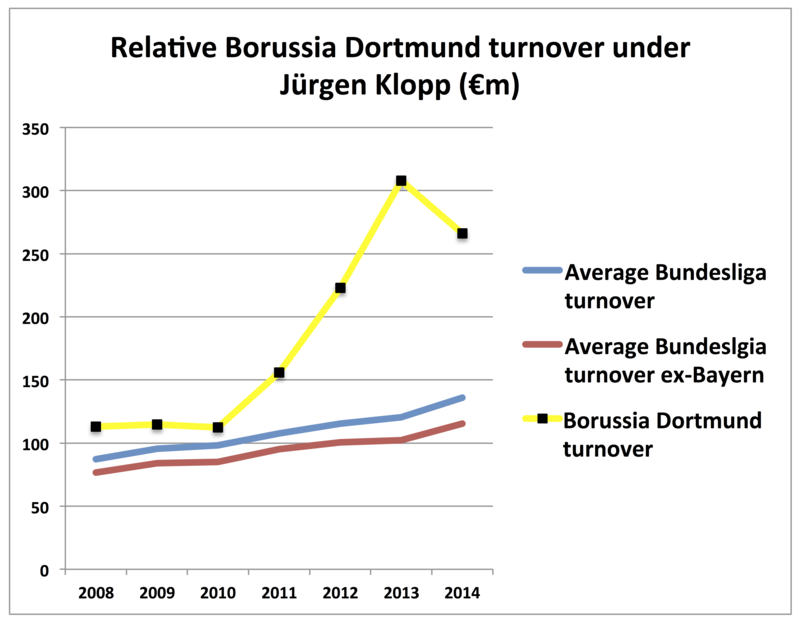 In his first two seasons, Klopp’s club had revenues a third higher than the Bundesliga’s ex-Bayern average. Take away the Champions League income of all of the top four and Dortmund would comparatively have been extremely well endowed. In German football, where money goes further than in England, Klopp’s side could in his first season spend more than 60% of the average Bundesliga club’s turnover (including Bayern) on wages and player signings. This expenditure, which I term ‘football investment’ was at a level that many others could not match. What it did was to bring Lewandowski to Dortmund from Lech Poznan in Poland’s Ekstraklasa in July 2010. After an indifferent first season in terms of goals and assists, in which his physical presence nevertheless helped propel Dortmund to the Bundesliga title, his injury-free ubiquity was instrumental in keeping his team in the top-two places for the duration of his time in Klopp’s side. This is very important. Because although Deloitte’s Football Money League shows that in 2009-10, Klopp’s second season, Stuttgart, Schalke, Hamburg and Bayern all generated more revenue than Dortmund, Klopp’s team were still within a couple of million euros of being among the 20-richest clubs in Europe. With Bayern struggling to punch their weight at the time of Klopp’s arrival, and Stuttgart and Hamburg slipping out of the Champions League reckoning at the end of 2009-10, the stage was set for Klopp’s third season (and Lewandowski’s second) to be transformative for Dortmund. The title was won, revenues rose and so began the virtuous circle of increased turnover, raised football investment and improved football performance, all of which drove each other. By the end of 2010-11, Dortmund were Europe’s 16th-richest club, eclipsing Hamburg and Stuttgart with a wage bill and transfer expenditure befitting of that status. These are the kind of returns Liverpool’s owners envisaged when they hired the German to take the reins at Anfield. But the path to a similar transformation in England is harder to tread. Whereas in Germany there is only one Bayern Munich, in the Premier League there were Manchester United, Manchester City, Chelsea and Arsenal all in the top eight of the 2015 Deloitte Football Money League. Although Liverpool are England’s fifth-richest club and had the fourth-highest football investment in 2013-14, the season for which the most-recent figures are available, the current Premier League table suggests their squad does not have the quality of Arsenal’s, whose expenditure lagged behind Liverpool’s in 2013-14. Breaking in to the top-four elite and scooping the riches that brings is commensurately harder in England than in Germany, where since 2012-13 there have also been four Champions League slots on offer – in part down to the achievements of Klopp’s Dortmund. There are of course caveats: Liverpool have already managed a second-place finish once in recent years and Chelsea seem to be doing everything they can to make others’ routes to next season’s Champions League that much easier. But there are lessons in both those caveats, and these are that achieving the status of champions, even of Champions League participants, is a job of work for English teams, and it can take its toll on the following season. Even if they were to attain a top-four place, whether a rigorously hard-working Klopp side could sustain that pace for throughout a Saturday/Wednesday, Premier League/Champions League cycle is moot. He also does not have a Lewandowski to rely on because, good though he is, the injury record of Daniel Sturridge tells us he is nowhere near as dependable as the Pole. There will no doubt be difficult times ahead for Liverpool – the expectations raised by the Kloppmania that swept the club upon his arrival are likely to prove more than a little over the top. But Chaucer’s Franklin’s Tale taught us not only that patience vanquishes, but also that loved ones should always be appreciated, however circumstances may make them seem. Sure, patience is in short supply in football, but should Klopp prove more normal than his record may on the face of it make him appear, then Liverpool’s owners and fans will need to find some. Journalist and broadcaster Matt Scott wrote the Digger column for The Guardian newspaper for five years and is now a columnist for Insideworldfootball. Contact him moc.l1556264115labto1556264115ofdlr1556264115owedi1556264115sni@t1556264115tocs.1556264115ttamt1556264115a1556264115.